Sink into the most relaxing and comfortable softness. Covered in luxurious natural colored Rex Rabbit fur, our Cushion Cover Pillow is handcrafted with silk backing and features an invisible zip closure. Most people have never felt the ultra soft thick fur of Rex Rabbit, much silkier and more durable than common rabbit so the soft touch can be enjoyed again and again. Rex Rabbit is praised as "nature's velvet" and lacks the prominent guard hair that characterizes common, rougher rabbit fur. 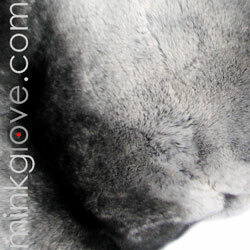 The result is a silky, dense fur that furriers say most resembles chinchilla or sheared mink and has almost no shedding. Fur is unmatched for its tactile luxury and brings a rich natural look to any room. Single sided pillows feature soft fur on front side and premium rich pure silk on the back side.